I am not much of a mobile gamer, mostly due to smartphone batteries being so poor, but sometimes a game comes along that it is difficult not to keep playing. Swamp Defense is one of those games! 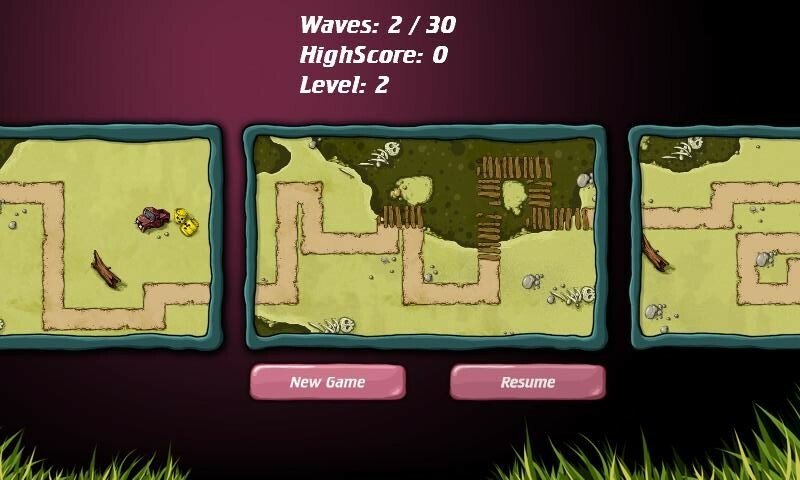 It is a simple and fun tower defence game which isn't too difficult for beginners, and has enough to keep experts entertained. It also supports the popular OpenFeint mobile gaming network. For people who don't know how a tower defence game works it's quite simple. Stop the enemy from getting to your base, or in this case from one side of the swamp to the other by building an army of towers to try to stop them. 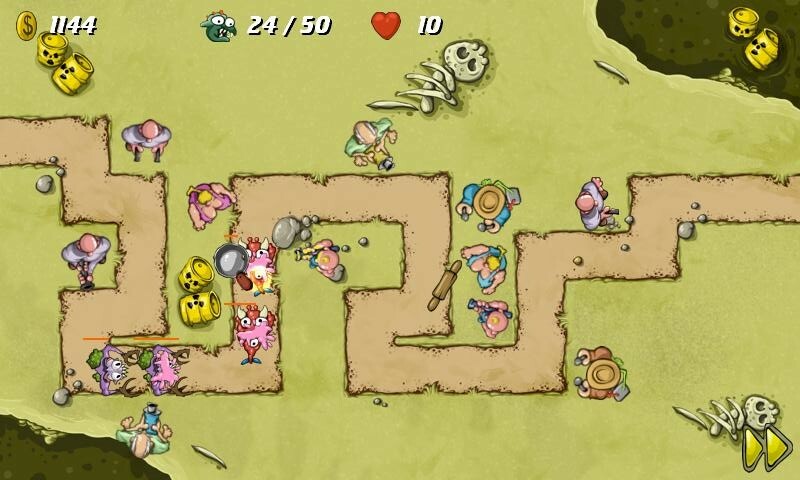 Swamp Defense has pre determined path for each of its 16 levels (so far) which all the monsters have to follow making it slightly more difficult when you get to higher levels as the paths get shorter and there is less space for you to plant your towers effectively. Swamp Defense is based around the Flint Family as they try to stop the 8 different types of enemies from getting to the other end of the swamp. The family has 5 different members (towers); Buster, Old Flint, Maggie, Hank and Little Joe. Each tower has different weapons with their own attributes and each tower is upgradable to add damage, range and speed to their attacks. One of the fun things about the game is the actual weapon of some of the towers, in particular Maggie and Old Flint who use kitchen utensils and denture adhesive (to slow enemies down), respectively, to help defeat the enemies. To unlock new levels you have to stop a number of enemy waves from reaching the end of the swamp before you run out of your 10 lives. After you have unlocked a new level you may choose to go to the unlocked swamp and start there or continue in the same swamp just to get your wave count up. The number of towers you may build is only limited by the amount of money available and number of spaces available on the map to build the towers. Towers may of course be sold but may not be moved around the map so make sure to place them effectively. Each of the enemies has its different characteristics. Some are quick and weak some are more like tanks, slow but may take a lot more damaged to defeat. At the end of every 10th wave (10, 20, 30, etc...) a boss enemy, which I think is a crocodile, spawns. They are very slow but are very tough to kill as they can withstand large amounts of damage and if they get to the other end of the swamp, reduce your number of lives left by 2. Also, with each wave the enemies get tougher so if 2 hits kills a particular enemy in the 1st wave, it will take around 5 hits to kill by the 12th wave. One of the best features of the game is its brilliant save mechanism which makes it seamless to jump in and out of. One of the best save mechanisms I have seen on any mobile game. It simply continues on from where you left off, even after a phone reboot. It works buttery smooth on my now ageing HTC Desire and has a fun, quirky cartoonesque art style. If you were not one of the people who got it free from the Amazon Appstore, then I would recommend buying it from the Android Market or at least try the free lite version of the app.